First impression | BMW makes a good start. The 1-series is not an existing car that should bring in a higher price because of its new look. The designers have developed a completely new underframe. Insiders share the information that this underframe along with some minor adjustments will be the basis for the forthcoming 3-series. The technology too (think bigger engines) will appear in the new 3-series, to be introduced in March next year. Notwithstanding the "series", typical BMW-technology makes up the heart of the car. 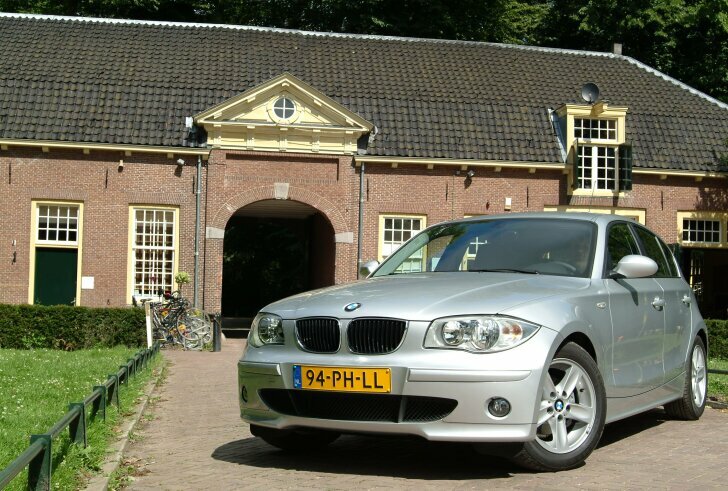 Driving enjoyment in BMW's smallest had to come first too. That is why also for the 1-series the tried and tested recipe of transmission to the rear wheels and the engine in the front has been applied. Lightweight materials are used not only to keep the weight down, but also to come to a perfect distribution of weight (50% on the rear wheels, 50% on the front wheels). A wheelbase that is rather long for this class brings about a distinguished appearance, but also provides maximum stability and much space. Technologically speaking, a promising start. In one word: potential. How much space the 1-series offers becomes obvious while getting in. The space in the front of this "smallest" BMW is in one word overwhelming. With the front seat in the furthest back position, the steering wheel and the pedals are exactly one light-year away from the driver. The seats of the test vehicle (with "Sportline"-package) are adjustable in every way possible. Especially the seat, which is adjustable in length, deserves an honourable mention. The seats are comfortable and soft and offer lots of sideways support. Getting into a car like this makes the first impression a particularly good one. On the other hand, the head- and legroom in the back only score "sufficient". The boot is not more than "sufficient" either, despite its remarkably easily and quickly foldable back seat. This estate car is obviously not meant to be a carthorse. Moreover, the low seating position, relatively small side windows and the sloping rear makes it difficult for the driver to see the extremities. Although the 1-series is literally at the base of the BMW programme, the interior's finish and design are equal to more expensive models. The idiosyncratic handling of the indicators and window wipers are adopted straight from the higher models. Even BMW's excellent iDrive system (see the 5-series test report) is available as an option. The 1-series is the first BMW with a start button instead of a key. The driver only receives a "cube" that fits into a hole on the right hand side over the steering wheel. Then one push on the button (and pressing the clutch simultaneously) is sufficient to start the engine. In one word: ergonomical. The expectation is that the 118d, the lighter of the two available diesel engines, will be the most popular and therefore the most driven one. BMW positions the engine as low as possible to lower centre of gravity and as a consequence positively influence road handling. To get ahead of things: this for a BMW concept "small" engine boosts the positive feeling from the start in a big way. The engine has an alert response to the accelerator and communicates optimally with the driver. This lightest of the diesel engines does not make the "1" into a fast car, but it feels the best possible. The driver knows instantly when and how much back up is available and how the power source will respond in any given situation. The same goes for the clutch and the smoothly operating 6-speed gearbox. Only the brakes should have had more bite and been more powerful to match its otherwise sporty character. Steering is pleasantly sturdy and precise. Because of the rear-wheel drive stability in the bend is achieved using the accelerator, although a stronger engine than this 118d would increase this effect considerably. The stiffly adjusted underframe makes an appropriate finish. In the end, every ride in the 1-series is incredibly satisfying and with this newcomer BMW offers an almost addictive car. In one word: pleasure. Bigger, more spacious and more luxurious cars are for sale for the same price as a BMW 1-series, but that is not what it is all about with this "Premium" estate car. BMW however does not sell an image or empty marketing-talk. What matters with the 1-series is driving quality that provides this newcomer with undeniable added value. This is first and foremost thanks to the technology that consists of a perfect distribution of weight, an absolutely superb rear-wheel driven diesel engine and finally fantastic road handling. To be more specific: in this price range the BMW 1 series is currently the best steering diesel around. Furthermore there is innovative technology consisting of several ergonomical inventions, lovely sports-car seats and proven active safety from BMW (also see the 5-series Touring test report). The idiosyncratic design completes the current BMW-generation. That is why this smallest BMW is by no means a "logo with an enormous price tag". At long last a premium with an apparent added value. In one word: recommendable.